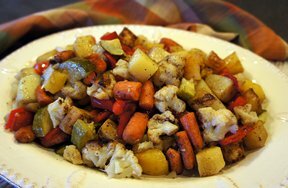 Any combination of vegetables will work in the side dish but the ones listed below are my favorites. The carrots sweeten right up when they caramelize throughout the cooking process. Put all vegetables in a large bowl. 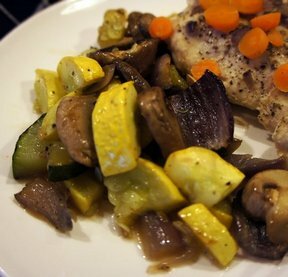 Drizzle olive oil slowly over the vegetables. Add salt, pepper and garlic. Stir and add salt and pepper again. Stir one last time. 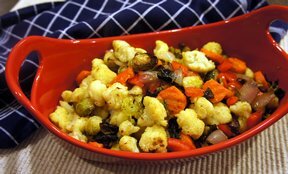 Pour vegetables onto large baking sheet or cookie sheet covered with aluminum foil. Bake 40 minutes at 400 degrees, stirring halfway through. Stir again. Drop oven temperature to 350 degrees and bake 10 minutes. "Be sure the vegetables aren't overlapping and your pan isn't overloaded otherwise you will end up steaming the vegetables. This will taste SO much better if they get caramelized slightly. 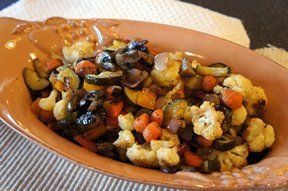 The mushrooms and cauliflower are my favorites."